A nearly four-ton satellite fitted with a modernized camera to collect more timely images of typhoons and severe weather bolted away from a seaside launch pad in southern Japan on Wednesday, riding an H-2A rocket on the way to an orbital perch more than 22,000 miles above Earth. The Himawari 9 satellite, built by Mitsubishi Electric Corp. and owned by the Japan Meteorological Agency, will cover the Japanese islands and a swath of the Asia-Pacific stretching from India in the west, to Australia in the south, and to Hawaii in the east. Meteorologists in Japan, Australia and other nations across the region will rely on Himawari 9 and the sister satellite Himawari 8 launched two years ago for weather imagery through at least the late 2020s. The 7,700-pound (3,500-kilogram) satellite lifted off at 0620 GMT (2:20 a.m. EDT; 3:20 p.m. Japan Standard Time) Wednesday on top of a 17-story H-2A rocket from Tanegashima Island near the southern end of the Japanese island chain. Running a day late after inclement weather prevented the rocket’s rollout to the launch pad, the two-stage H-2A launcher, flying for the 31st time, turned east from the Tanegashima Space Center to fly over the Pacific Ocean. Its hydrogen-burning LE-7A main engine and two solid rocket boosters pushed the rocket higher on top of 1.4 million pounds of thrust. In less than two minutes, the two boosters had propelled the rocket to an altitude of 28 miles (45 kilometers) and consumed their powdered fuel. The rocket jettisoned the boosters to fall into the Pacific Ocean. The H-2A released its nose shroud about two minutes later, once the rocket was out of the dense lower atmosphere, and the rocket’s orange foam-covered first stage shut down and separated about six-and-a-half minutes after liftoff. 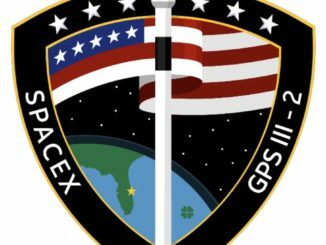 Two engine burns by the H-2A’s second stage LE-5B engine finished the job of putting Himawari 9 in an egg-shaped geostationary transfer orbit, and the new weather observatory deployed from the rocket around 28 minutes into the flight. Tracking data reported by the U.S. military show the Himawari 9 satellite in an initial orbit ranging in altitude from 153 miles (246 kilometers) to 22,284 miles (35,863 kilometers), with an inclination of 22.4 degrees. Those figures are very close to preflight predictions. 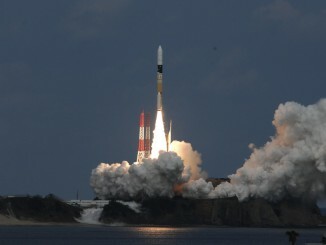 Japanese officials declared the launch a success, giving the H-2A a record of 30 successes in 31 missions since its debut in 2001. Himawari 9’s electricity-generating solar panel was expected to unfurl soon after launch, and the satellite will next fire its on-board engine for a series of maneuvers to reach a circular post nearly 22,300 miles (about 35,800 kilometers) above the equator. 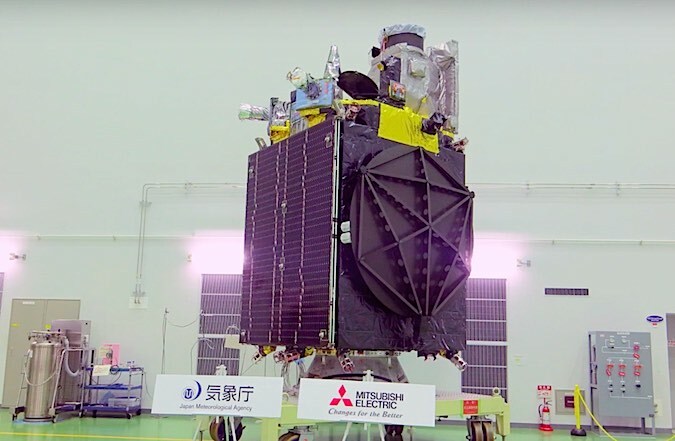 It will take about 10 days for Himawari 9 to enter geostationary orbit, and the satellite should enter service early next year, the Japan Meteorological Agency said. In that orbit, Himawari 9’s speed moving around Earth will match the rate of the planet’s rotation, allowing the observatory to stay in a fixed location at 140 degrees east longitude, giving it a view of much of the Eastern Hemisphere. Himawari 8 and Himawari 9 replace the MTSAT 1R and MTSAT 2 observatories used by Japanese forecasters since their launches in 2005 and 2006. The new Himawari satellites carry U.S.-built advanced imagers made by Harris Corp., the same type of camera that will soon launch aboard NOAA’s GOES-R geostationary weather satellite Nov. 16. Japanese officials plan to keep Himawari 9 in standby mode to back up Himawari 8 until least 2022. 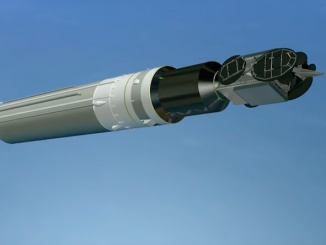 In addition to replacing Japan’s aging weather satellite fleet, the new generation of meteorological observatories offer improvements in imaging resolution and cadence, giving forecasters better data faster. The Advanced Himawari Imager can take pictures of the entire disk visible to the satellites every 10 minutes, an improvement over the 30-minute scans produced by the MTSAT-series. Localized images of Japan and typhoons can come down from the Himawari 8 and 9 satellites every two-and-a-half minutes. The Japan Meteorological Agency shares the satellite imagery publicly, allowing forecasters from across the region to use the data. The camera on Himawari 9 can also resolve cloud features half the size visible to the previous Japanese weather satellites, and the advanced imager has 16 spectral channels in visible and infrared light, up from five bands on the MTSAT-series. The upgrades aboard Himawari 8 and 9 help meteorologists distinguish between clouds, fog, smoke plumes and volcanic ash. Himawari 9 is the ninth spacecraft in Japan’s Himawari, or sunflower, series of weather satellites.